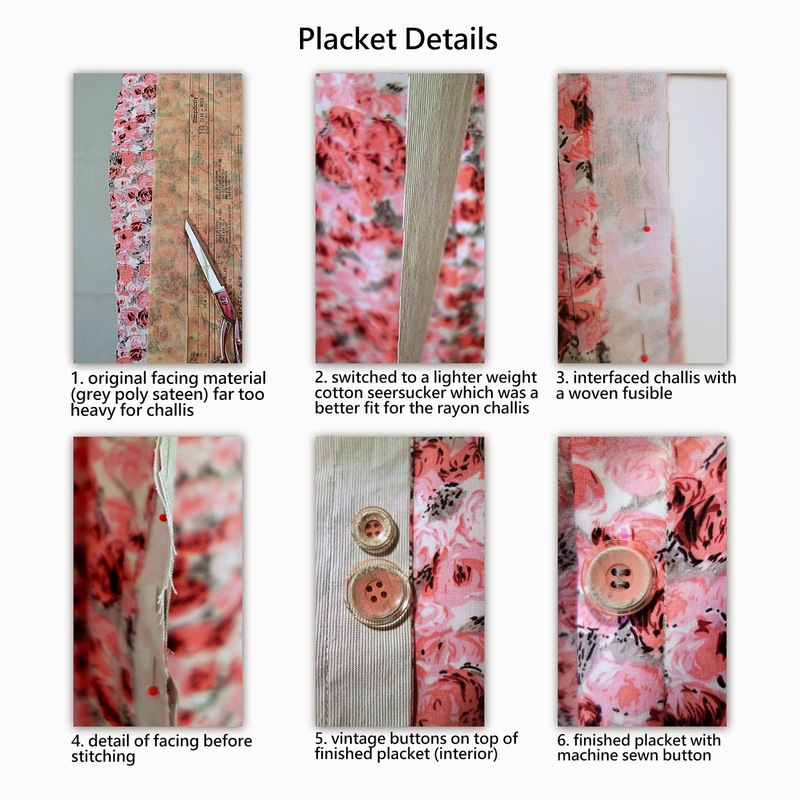 Fabric Mart Fabricistas: Made by a Fabricista: Romantic Rayon Challis Rose Dress. Made by a Fabricista: Romantic Rayon Challis Rose Dress. 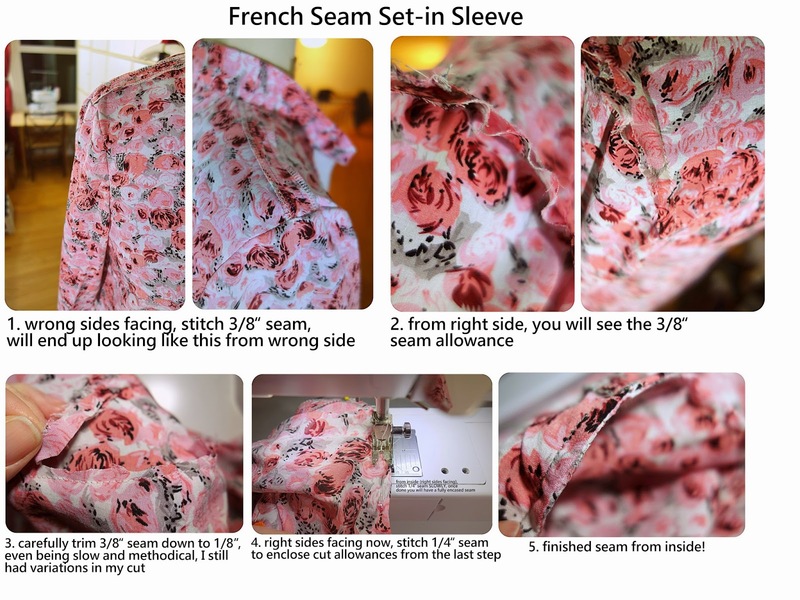 I threw around a few fabric/pattern combinations, but ultimately decided to use this amazingly soft and prettily rose printed rayon challis. (Hurry if you like it, there are only ten yards left at the point I write this post.) Picking out the dress was proving to be more of a challenge, though. I know rayon challis is best for floaty dresses with minimal closures (I toyed with this Burda magazine pattern), but I kept thinking, "I need longer sleeves so I can wear this in winter!" One, because longer sleeves mean more arm coverage when it is cold outside, and two, because I wanted to be able to hold the bottoms of the sleeves with my hand when pulling on coats and cardigans (I hate it when 3/4 or shorter length sleeves get caught in coats and cardigans in the winter). Well, I ordered this very pretty Vogue pattern from an ebay seller, but it didn't arrive until a week later, and I *needed* to get to work on it, so I just gave up two days before it arrived and went with Simplicity 2246, a lovely Lisette shirtdress pattern with multiple views. It did not have a long sleeve view, but I also knew I could add inches to the sleeve pattern to get that, so I wasn't worried. I thought briefly about making the full-skirted view of this dress with the longer sleeves, but I realized if I was careful with my cutting *and* I used view A (the straighter silhouette shirtdress), not only would I have a pretty dress, but I would have enough fabric left over to make a top from the remnants. That top is not done, but it is cut out, and I promise I will show that off to you when it is done. In order to make this straighter silhouette work for my frame, a pear shape, I knew the top of the dress would have to be cut in a 10, while the bottom bit would need to be made in the largest size in the packet, the 14. I basically manipulated the pattern the same way I did for Burda 7137, so take a look here if you would like to see how I adjusted this pattern for my larger lower half. I did make sure to staystitch all the neckline/shoulder bits, and that definitely worked to keep Miss Rayon in her place. Also any bits that I interfaced, like the collar or placket, definitely behaved, but I didn't want the entire dress interlined since I wanted to keep the drapy character of the fabric present. I would have loved to have a longer hemline, and I will remind myself to add an inch and a half to the hemline the next time I make this dress up. The sleeves are long, as you can see here. The are slightly bell-shaped, since I chose to lengthen the sleeve by adding three inches to the hem of the sleeve versus at the "lengthen/shorten" line on the pattern. Ultimately it was a design choice since I wanted a slightly boho/romantic look to the dress. Shirtdresses can look very severe and tailored, and I felt like a flowier sleeve would give a sweeter look to the dress, especially in view A. Construction of the placket took some consideration on my part since the fabric was so lightweight. I originally had chosen a slightly shiny poly sateen for the placket facing, but realized after cutting it out that it would weigh down the interfaced rayon challis too much, leading to a very droopy placket (the rest of the dress would have not been able to support that weight since the rest of the dress, barring the collar is not interfaced or lined, at all). I found this fabric in my remnant pile (it also served as the back of my Grainline scout tee/tunic), and this fabric was a much better choice since it had a firmer structure, but was much more lightweight than the sateen. The buttons were a find! I have a source for vintage buttons near me here in Virginia, and after inspection of a few candidates, I realized these plastic pink/grey versions were the most perfect choice. Because the bigger button was 5/8", though, I had to increase my placket width by a 1/4" on each side to accommodate the extra width needed (the pattern calls for 1/2" buttons). Because I had already cut the plackets, I just decided to slim down the seam allowances from 3/8" to 1/4", and in the end, that was enough to get the buttons to properly fit. The smaller button, btw, is for the *fake* collar stay closure. I didn't have a ton of room there for a larger button, so I used the wee button instead. I have a serger, but I know that on wovens I have a really tough time serging around curves, so I *never* serge those kind of seams with my serger. I even had a little serger mistake on one of my straight seams owing to the very lightweight feel of the material (I had overlocked a bit of the dress while finishing the seams since I didn't feel the bottom layer even though I was trying to be careful!). In the end, the mistake was not that big of a deal, but it definitely kept me from wanting to try and serge the set-in sleeve seam's raw edge. I also had this goal upon sewing up this dress that I could wear it in both winter and summer. Above it is styled as I wore it yesterday (yep, sewed it up and on the day I finished, I wore it). I was heading to my son's school where he was going to a Valentine's Day party. Well, obviously a pretty pink/red/grey/ivory rose print dress is utterly perfect for that occasion. Side view. I added the belt for more definition at the waist, and the necklace was added to soften up the severe look of the fully buttoned up placket. I did not have to wear a slip, btw. The challis did not stick to my tights as I feared it would. I think as long as you make sure there is enough ease in the pattern you choose for what you do with the challis, it will properly drape and float away from the body, and it is silky enough that it won't stick to most other fabrics. I did not wear this cardigan, but I did try it on to make sure I could properly pull the long sleeves down with my hands while getting on this sweater. It was fine, and it did not get caught on the inside of the unlined cardigan sleeves at all. Last night I chose to continue wearing the dress, I just took off the necklace and belt, and unbuttoned the top button. Besides the fact that it felt like -612 F outside with the wind chill, I quite enjoyed wearing out for my son's birthday dinner (yep, his birthday was the same day as the Valentine's Day party). I had no problem with the sleeves getting caught in this coat, either, but I will tell you to grasp the cuff firmly since I tried getting the sleeves in the sleeve of the coat without grasping well and it definitely got caught on the coat sleeve. And here it is summer styled. I love the easiness of this dress for summer, put it on over a swimsuit for the beach, and you are ready to go from the surf to the spot where you are eating out for lunch. I also can see belting it loosely with a tie belt, a cute straw clutch, and low-heeled strappy sandals, and you have a more formal version that can be worn to brunch or garden parties. Happy Valentine's Day! Thanks for gracing us with this lovely dress. Wonkiness of the fabric when manipulated is one reason I stay away from rayon, but your dress is stunning. I love the look of this dress. I think you did a wonderful job. This is so charming! Add me to your list of admirers (though I am no longer in the second grade!). I love rayon challis as well - to wear, that is; sewing with it is a 'challenge' and you met it very well! You are so kind. :-) I have heard that my daughter, when she turns seven, wants to stay seven for the rest of her life. Since I am such a fan of that age group, I would perfectly okay if that happened. Isn't rayon challis such a dream to wear? Wooow!! Such a lovely shirtdress Dina!! I hope someday in the future I will be able to sew a shirtdress too, they are my favourite dress! I guess the pattern is suitable for the intermediate sewer? Im very much of a newbie still, dont have much time for sewing as of late. Hi, Monica! I think I could have made this last year, when I was in the advanced beginner stage, since I made a fitted shirt with a bow collar and button-up placket. So I would say if you have the will, you probably have the way. I literally tell myself, just stitch each seam, one seam at a time, press each bit one at a time, and slowly but surely all the bits come together. I think only focusing on the immediate task at hand keeps each sewing project manageable, I don't get too overwhelmed by EVERYTHING that has to be done. I would love to see you in this garment, so I really hope you'll try!! !